I've been asked by my guy friends for years to make a mens line, so boys, here it is! 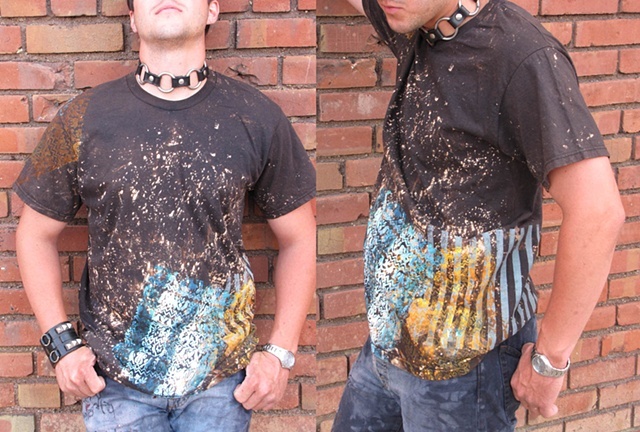 100% Cotton shirt splatter bleached with 4 layers of silkscreen print-painting. THIS IS A CUSTOM ORDERED SHIRT which means that everyone will vary slightly in color, pattern of the splatter and the orientation of the screen prints. Please specify size when ordering as well. I've developed a technique of layering and coloring the screens that creates a look similar to an abstract painting, creating a different look than just printing strait on the shirt. The colors and patterns move as you move. The pattern is printed more or less in the round, taking into consideration that there is a back to the shirt as well that you may not see, but other people do, so there should be something on it, right? i think so. Each one is individually created and unique and can never be completely duplicated in the exact same way. Think of it as a original work of art you can wear! Fits somewhere between a medium and a large, a bit larger than some mediums, definitely smaller than a true large. *****If you would like this shirt in a different size, i can custom make you one. Please contact me if you are interested. *****Each shirt is prewashed and will not shrink. i recommend washing these shirts in cold water and letting it air dry to preserve the color and quality of the artwork.